Hello! Yes, I know that already did wallpaper with this vector, but I have wanted to do else one. Simply, I much love this vector) Background drew whole day, as always in Adobe illustrator CS4 and Adobe Photoshop CS3. Please stop using that texture over your walls it kills the vector and the overall quality. And I see your walls have a lot of effort in them, and look really beautiful, that's why don't add textures over them. Quote by Sakura-DustBeautiful minus the texture/filter. I have did since wanted, if you do not like this, this not my problems. Beautiful wallie~! 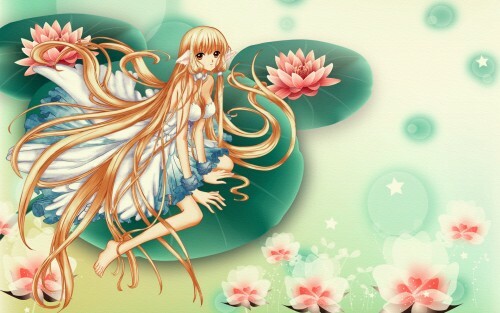 <3 so pretty~! Quote by Saku(...) minus the texture/filter. Yea lighten up, she was giving you a suggestion and you bit her head off. to act like that here, be nice and thank her for her suggestion even though you may disagree or whatever. and dirty. Remove it and I would say maybe changing Chii's hues a bit to match the color of the bg would be nice but it's not as bad. Looks fine like that, just throwing an idea. Anyways, nice wall. Quote by Karina21(...) minus the texture/filter. I have to a million times agree. The texture might be something you like, but in the opinion of many of us viewers thus far, the texture hinders the overall quality of the design. Sakura-dust is a very talented designer, so retorting like that is a little insulting. If she had straight out insulted it and not offered a critique and anything positive to say, I'd understand, but she was very kind and helpful. In the end, you really should just accept her critique whether or not you agree with it. If you don't agree with it, you could easily have said 'I appreciate your opinion, but personally I like the texture' and perhaps posted an alternative, textureless version in the summary. Now, I think the perspective was very hard to create, which you did very nicely I might add. I agree about the texture, but overall it's very nice. I'd like to see you try vectoring youself and see how your wallpapers would turn out. Your backgrounds are lovely. Vectoring can be very fun after a while. Very pretty wall. The idea behind it is very well thought out and you did a good job with the lotus flowers. I don't want to upset you either but I agree with everyone else about the texture. If you really like it that much then you could always just make it a bit lighter by turning the opacity down a bit. That way it'll be less obvious for us but for you still has the texture there. I just think that the style you have done it in doesn't suit the texture that's all. Or make a texture-less version and link to that in the description so you still have the version you like and other people can download the texture-less one if they want it. Oh and I know everyone else has already said it but... Critique can sometimes be hard to take (I've had my fair share of critique that I haven't agreed with in my Illustration classes at uni) but try to remember they aren't doing it to upset but because they want to help you become better. So when someone does mention something that you might not agree with take a deep breath, calm yourself down and just reply and say "thanks for the critique I'll keep it in mind for the next wall I make" or "I'll make another version so there are two. One the way I like and then an alternate on with/without this/that". I know the first reaction is to tell them where to shove it, but you have to remember that they are saying it to help you not to be nasty, so try not to jump down their throat. Still though you did a very well and it's a gorgeous wall. I think I might have to set it as my desktop now :D Keep up the good work. this wall is really gorgeous! I have to agree, the wall looks very well done, but the texture, god, kills the wallpaper. Other than that, it's a beautiful wallpaper. Wow Wow Wow! This is probably the most beautiful wallpaper I've ever seen! You are VERY TALENTED but what matters the most is that you have great taste. Some people make wallpapers that show great skill but are not really nice, this is certainly not the case. I JUST LOVE EVERYTHING ABOUT IT! Please keep up the work! This is really a beautiful wallpaper, the textures a great. Hope to see even more of your work! The brushes look fantastic on this, thanks for sharing. PS: Could you post the link to the wallpaper without the texture? That's lovely, and I like it very much!